The founders of Belgium startup Favebucket have been burning the midnight oil lately so that they can bestow upon the word a new way to save, share and inspire, any kind of web content in an all in one, feature packed, but extremely easy to use web app. Going all the way back to the Netscape Navigator days, bookmarks (or favorites) have been a way to save your favorite web pages. As internet browsers evolved they made it easier to share. Truth be told, in my opinion, sharing is easiest on the mobile versions of Safari and Chrome, however all of the current major browsers support url sharing through a number of channels. Well what if you only want to share an image, video, or social media update? Sure you can right click a photo and then pull it out of your saved photos and attach it to an email, and of course you can always “pin” it using Pinterest or any of it’s clones, but Favebucket takes it one step further, making it about 5 clicks easier. 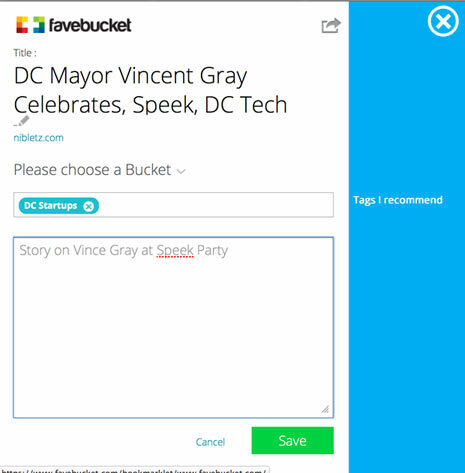 With Favebucket you simply use the bookmarklet on the content you want to save or share, add some tags to a quick pop up form and voila, it’s saved for your reference. If you want to share it, Favebucket allows you to quickly share it as well. All of your faves, no matter what kind of web content they are, are saved to your Faveboard. You can go back to your Faveboard and decide if you want to heart it (making it a favorite fave), share it, go to it or see the details you saved about it. Sharing lets you share it directly from Favebucket (ala dropbox style), email it, share it through Twitter, Facebook or pin it on Pinterest. While none of these ideas are new or earth shattering, bringing it all together as one, and making it so darn easy, is. We got a chance to talk with the founders of Favebucket, check out the interview below. What is your startup, what does it do? What is the startup culture like in Belgium? It is a very open culture, obviously much smaller than US and still with a lot to learn. Benelux startups need to get out in the open more and established business and venture partners should stimulate the entrepreneurs more and transfer knowledge and spirit. Reinvigoration would be welcomed by many. Keeping our heads together when the going got tough (thnx Billy Ocean). We have been creating and building what we just soft launched with our own time, sweat, effort, burning the midnight oil for months. And that is not easy, its a “make or break” test for a team. In that period you find if you fit together, if there is maximum trust and inspiration. And we found our modus, we got closer together, we actually did overcome. Roles models is a strong word. We create our position based on a mix of what we learned from great brands and their forerunners but also look at people we have around us. People in the advisory board with entrepreneurial knowledge and all sorts of different skills. Also in our families, mothers who are the best operational managers, dads who are great thinkers and tinkers. Not just one example but many. Being outside makes you want to prove more that you don’t need to be in a specific location as long as you are in the right market. It is about finding the right people, that is true, but we do not feel that being in the super heated center of all things “startup” is a good thing. It seems a very volatile culture with changing trends and a specific savoir faire that is not necessarily a good thing. People you hire might just leap away to the next big thing, the next “Meme”. That is not a fact in Europe. The bad thing is that the position investors and people take towards startups in Europe is held back. Less interest, lower investment levels and less specific knowledge in what you might call “typical Silicon Valley” ventures. Keep the audience in our market interested like we do now, tend to them, assist them. Find a good partner for advice, support, investment and business development experience. Where can people find out more, and what is your Twitter username? This startup, Cabcents, applies the “Priceline model” to ground transportation.